Last Thursday before going to bed, I played a game of Crysis 3. Without any particular reason, I ran Realtemp on the background. When I exited the game, I took a look at the maximum temps that were recorded by it. It was worrying. This was at an ambient below 25C. And this is just gaming. I was running the Scythe Gentle Typhoon 3000RPM fan which is cooling the radiator of the Antec Kuhler 620 (first edition) at around 1800RPM. The fan speed was lowered from the fan controlling software built into the UEFI of the Asus Z97i Plus motherboard. 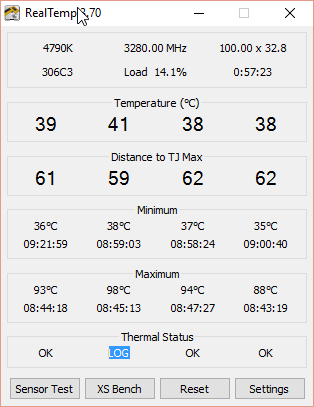 I let the fan run at its rated speed and that made the temps drop by 10C while playing Crysis 3. It was OK, but still too high for gaming. However, the next morning, I wanted to transcode a video in Handbrake and this sent the CPU temps to a whopping 98C. This was with the fan at full speed!!! I removed the case cover and retested. This time, the max temps reported was 86C. Still, it was quite a lot. Considering I was running the CPU at only 1.20V which is even lower than stock Vcore for this particular CPU, I was not sure what else to do. However when I removed the case, I saw that that there was a lot of dust inside the case. Thinking that the front air intake was blocked with dust, I took the front panel out. The dust filter was completely covered with dust. Part of the radiator was covered with dust as well. (Sadly I forgot to take a photo.) I vacuumed the entire area and tested again, with the case closed, because that’s what matter in the end. 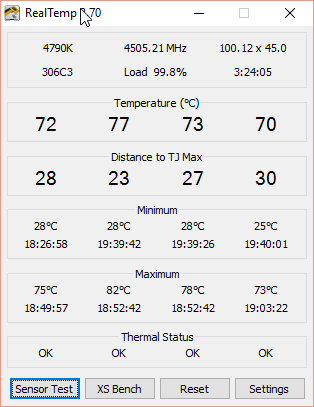 The temps maxed out at 82C in Handbrake, with the case closed. In a case as cramped as the Silverstone SG13, I think it is difficult to do any better without a thicker radiator like the ones that come with the Corsair H80i GT, CoolerMaster Nepton 120XL or the Fractal Design Kelvin T12. 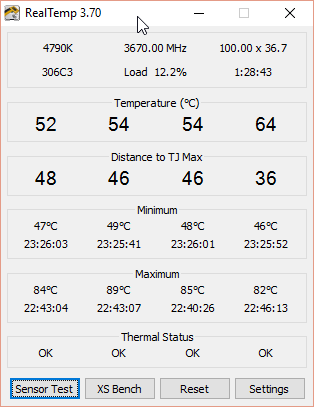 While playing Crysis 3 though, the temps are pretty respectable now. 64C max. What a drop! But, I run the fan at full speed and it is too loud for me. Others at home do not notice the difference. Weird! I am wondering whether to ditch this fan and get two low RPM fans for push pull. But I wasn’t able to find reviews comparing how single high RPM fan and two medium RPM (around 1800RPM) fans perform on a radiator. I am not keen on ditching $20 per fan! As a last resort, I was going to get a bigger case and either a dual 120mm radiator or the Noctua NH-D15 air cooler. But that would have cost me about $200, although they would have been a good investment. I still don’t feel like spending money on things that wouldn’t give me any performance improvement. Peace of mind is a thing, but it still shouldn’t cost me $200.